I think I can, I think I can...........finish this job this year! prairie, and no-one noticed for 5 days. In fact, it was a friend whom had stopped by, that pointed it out! Stupid Jamie. There was still a bit of underside work to finish up, so we put the whole assembly up on a couple of tables. It's pretty high already, to say nothing about the 4 more feet it will be sitting in the heart. 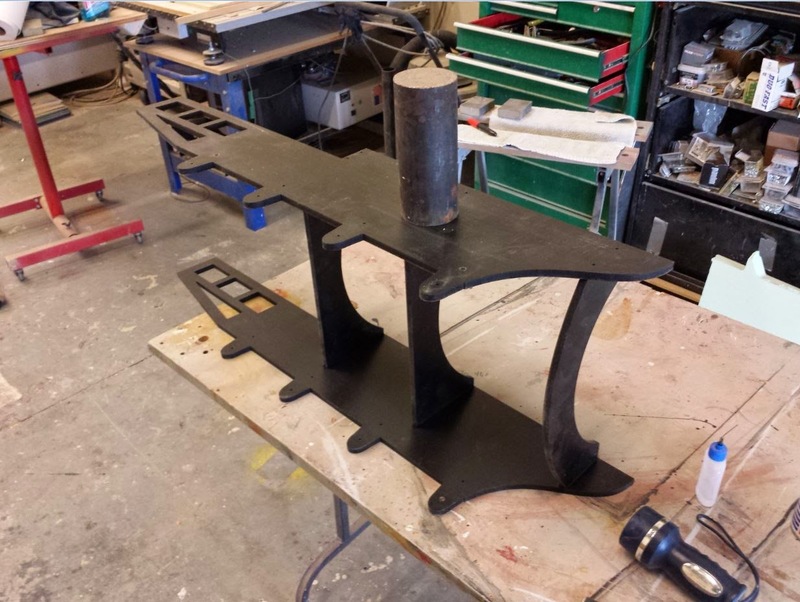 The very last step was to weld up the bracket that will bolt the bridge and the train together! That was a whole lotta crap working in that tight space! Quite the monster from down around this height! I had a few options for bringing the train whistle to life. But in the end, I decided to 3d print it. Who says 3d printing is "rapid prototyping"? Pfffff. HA HA! I do like his leaning back posture, and from the front, he kinda has "blowing cheeks"
I didn't even take the time to sand, and clean it up. I just went right to our 2 stage polyester primer, and applied it with a brush, because I didn't want to have to clean the spray gun for a tiny little bit of primer! Jody sanded it the next day, and it looked great! All in all, he looks awesome! Before I post about the train, I thought I would post an interesting link to a contest being put on by Tools Today! $500 in tooling at Tools Today is no slouch prize, that's for sure! That's American dollars to boot. I think with the exchange, it equals about $10,000 Canadian :) I know a lot of people use vectors with their cnc's, so make sure you at least check out the contest, you never know! Also make sure if you win, you get the Amana single flute up cut bits, I'm almost exclusively using those for everything now! The cab section, and coal car came into existence pretty quickly! Again, made entirely from .400 black pvc. The nice thing with pvc is being able to chem-weld it, as well as drive screws into it for added strength. The train barrel was the next on the list! I brought all of my 2d vectors into Hexagon, from Corel. From that point, I used the vectors to mass out the 3d pieces I actually needed. The barrel was the primary concern. I wanted slits down each side of the barrel for the walkway to slide into. This was for 2 reasons. The first being that it will look so much cleaner at the transition point between the 2 pieces, and the second being the walkways will actually clamp the barrel, preventing it from moving around, essentially making everything structural. A major concern for when the whole thing travels down the highway, at highway speeds. You can see the slots, and the flat section at the rear, that will locate the barrel, as well as have it sit level. From Hexagon, I saved out the final model, and sent it to STL Slicer. Another one of my favorite pieces of software! This makes slicing any stl file a breeze, and I like a breeze, that's for sure!! Stl Slicer chopped the model into 16, 2 inch slabs, because that's the thickness of the HDU material were cutting the pieces from. From that point, the pieces were sent to Aspire 8, for 3d machining. I also punched out the centers in Aspire, to cut down on as much weight as possible on the finished assembly. In order to keep the machine time down to something reasonable, I cut everything with a 1/2" ball-nose cutter, and took the time in the computer, to limit the toolpaths to just the 3d geometry, using a profile pass to finish of the vertical sections. Finally, the test fit.............................like a glove! Once again, the computer reigns supreme! Thank you computers, thank you very much! Skater dolly.......it's cooler than your thinking! I have been working on a video project recently, and I am really enjoying it! I am camera man-editor, director, etc! Or, as normal people say, "a one man show" HA HA! I have been wanting a small table dolly for some motion shots. There are a ton of them available, but by the time I drive to a pro video place, and back, it's a few hours. So being that I own a cnc, and have lots of material handy, I decided to draw one up, and cut it out. I also added angle degree markers for both axles, just so the front and rear wheels could be placed at the correct angles to each other. I have a box full of in-line skate wheels, which were the last part of the puzzle! All in all, it works great for what I needed. It was about 15 minutes to draw, and 30 minutes to cut and clean up and assemble! Plus I got my first shot with it already!! Oh, the train parts are flying off the cnc now! Partly because our Techno is very fast, and partly because some of them weren't held down very well!! The main chassis assembly got glued and screwed together. I'm not sure if I stated it before, but the Stettler train is all black, so we decided to fabricate all the parts from black pvc. Were pretty much using 1/4, 3/8, and 1/2" black. And while the chassis was being glued, even more parts came up ready to use! It wasn't long before there was some sort of semblance to train pieces. When I designed the chassis, and all of the parts that go with it, I designed everything to have slots, tabs, and pocket holes. This way, I didn't have to waste much time aligning pieces. They would automatically fit right where they were supposed to! I made the wheels oval, and slightly tilted forward, giving a sense of speed to our little train. I'm really digging the way it's all starting to come together, and fast. This is pretty much the end of line for the wheel details. I tiny bit more, but for the most part, The chassis is almost complete! My plastic order should be in tomorrow, so I'll be able to get started on the cab, and coal car! Today was a day for paint! Finally, some colour! Not for me though, I get Jody to do it! Although it didn't actually take too long to do. We're just doing a 2 colour paint job on these. Most people won't be able to get too close to the final float, on account that most of the time it will be moving! So doing just 2 coats will keep the final paint job pretty contrasty. Just what we want! So far so good! I love them! I got all the train parts figured out in Corel, and ready to import into Aspire. I think my favourite part of Aspire, is how well it works with all of our other software. In-fact, I usually end up tweaking my final vectors in Aspire, due to how easy it is to add things like dog-bone fillets etc. Then off to our Techno cnc for cutting. I have been using our Tools Today cutters quite a lot. These are the Amana up-cut, single flute cutters I spoke about a while back here: Cutters. I used to use mostly parallel flute cutters on pvc, but the edge quality with the Amana cutters makes it really hard to go back now! All of the train parts are just going to be layered flats. It's a fast, strong way to build "seemingly" 3d depth. We had to actually put the Stettler float on hold for a bit. 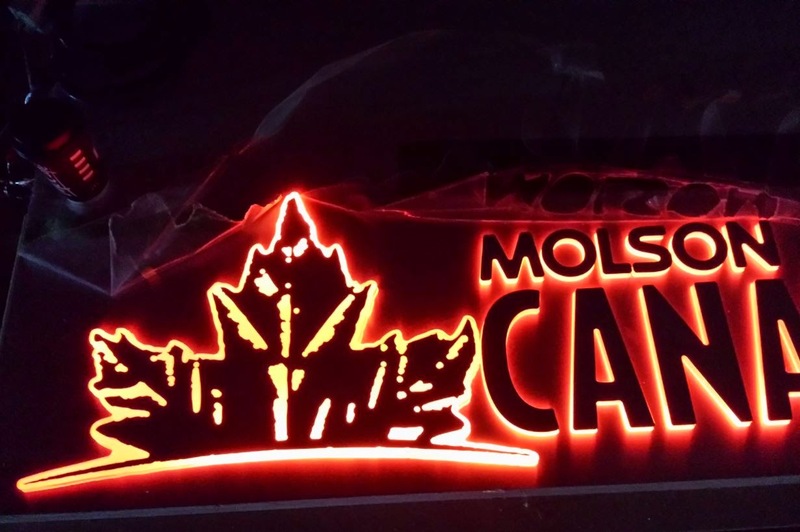 We had a job come in for Molson's beer, and it was a fairly big job, with no blogging about it, but I'll share a cool pic! Lot's of LED backlit wall panels, and laminating veneer and aluminum over MDF and acrylic. Not super cool, but more of a challenge. It was supposed to be installed on the 2nd and 3rd of March, but the location wasn't ready, so we were pushed back until April 7th and 8th. Photo's of that coming when it's installed. In the meantime, we're back on the Stettler job now. Shortly after the framework for the heart, and the bridge was test fit, I decided to change the design. A small change in theory, but a huge change in terms of re-work, and fabrication! The answer was to put the whole bridge, and train attached, on a vertical slider system. This won't be a powered system, they'll still have to use a small ladder and lift it, then lock it in position. BUT, the benefits far outweigh any small things like weight and gravity! HA HA! I used 2" steel tubing, and welded 1/4" rod on all the inside edges. The rod essentially becomes the rails in the system. There's also a hard stop welded to the sliders to stop the whole thing from crashing down into the heart. Each end of the opening got the track system made. The rollers were actually heavy duty patio door sliders. These were designed to ride on 1/4" rails. The system is pretty slick! This minor/ major change actually ate up 2.5 days on our end, when you include the added design time, and re-work to the heart assembly! 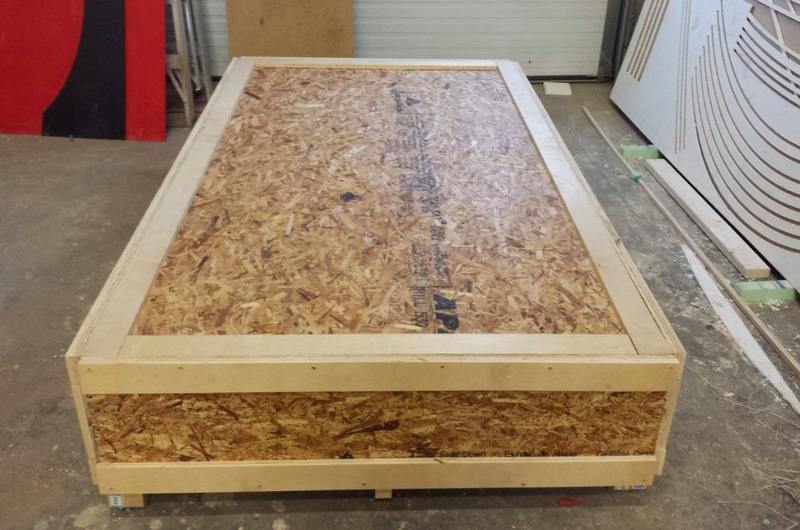 It's a little hard to believe that a heart that big could be collapsed down into a 4 X 8 X 16" tall crate.